After the first cave painting the next guy took a look and added something new, but used something he just saw in the old painting. So it goes. In my opinion the real question is not your style or technique, but the ideas/concepts you are putting out there. It seems to me some of the “fresh, amazing and totally new” stuff is actually gimmick work and carries very little or no concept. 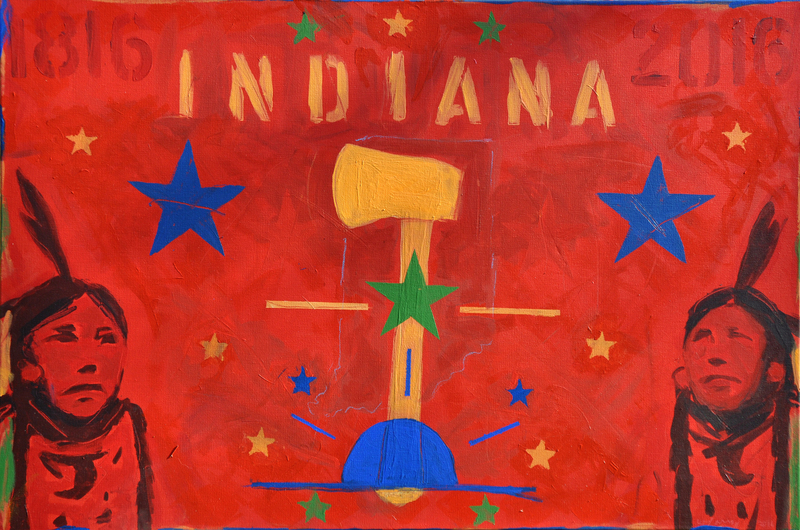 The painting I just finished for Indiana’s bicentennial is going to suggest Jasper Johns because of the technique, using stencils. But I am not concerned because I believe the ideas overcome that. Once, when I was in school I told one of my professors about an idea I had but expressed concern that it would be too obvious that a source was another artist. He said, “Do it anyway, since you are doing it the thing will turn out differently.” He was right. So my free advice is to do it anyway. The big mistake is to not do anything.